The Spanish civil war of 1936-1939 was a siren song for young Socialists all over Europe, an opportunity to fight Fascism (and Franco) in a major European country after the recent disasters in Italy (Mussolini) and Germany (Hitler and the Nazis). Communism, if not totally ascendent, had yet to be fully tarnished by the eventual global realization of how Stalin was starving and imprisoning his people, nor just how Communism-in-practice actually worked in the USSR. The ideals of socialism were very much intact, and in many ways remain intact to this day, although distinct lines were then being carefully drawn between the democratic socialists, the more hardened theoretical socialists, soft Communists, and Stalinists. The 1930s were a hothouse environment for ideology, and you couldn't have picked a better spot to watch competing versions of the truth play out than in late 1930s Spain. Englishman George Orwell did just that, enlisting on the government's side to try and keep the fascists from taking over the country, which, we now know, was a futile effort. Orwell did not know that, even upon completion of this book – in fact, "HOMAGE TO CATALONIA" ends with Orwell musing about likely outcomes, not one of which seriously entertains Generalissimo Francisco Franco being the strong-arm boss of Spain for the next forty years. Orwell kept a journal of his adventures, which are musings of a young man trying to come to grips not on what he's fighting, but what he's fighting for, and with whom. The book is by turns humorous, tragic and a work of deep political science. Orwell's socialism is the purest of socialisms, one that believes in blowing up distinctions between the classes and ending both the aristocracy and the dominance of organized religion. His enlisting in the POUM, a "Trotskyist" Communist group, is more or less enabled by complete accident. He simply wants to defeat fascism, but his POUM membership helps to give him a ringside seat for a confusing jumble of political allegiances, angers and, later, murders – all from and on the Left. The Right, the fascists, are only the object of mockery and pity in this book. "HOMAGE TO CATALONIA" uses alternating chapters to tell, first, Orwell's story, and second, the story of the politics behind this war and the wars-within-the-war. Orwell's story is pretty funny and self-deprecating. He says early on that he barely shot a gun or killed anyone, but we later learn that he not only shot, he both likely killed other humans and was severely injured by a bullet in the throat himself, guaranteeing him exit from the war (which he's fairly relieved of, after many months at the front). He spends much of the book contrasting his lofty ideals with the grim realities on the ground, and how men, both smart and pigheadedly stupid, are herded into fighting units and then given the barest of munitions to help them achieve their aims. Like many books on war, the emphasis is on the boredom and excruciating tedium of it all, punctuated by very rare "action". This action was often absurdly pointless unto itself, and throughout the book you watch a budding realization about the nature of conflict dawn on a young man's conscience. 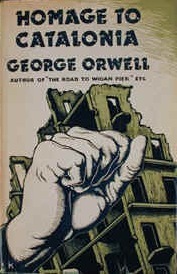 Orwell took great pains to describe the nature of the battle between the two main Communist groups, the POUM and the Stalinist PSUC, as well as the other internecine battles with anarchists, trade unions controlled by anarchists, and other sects. This all culminates in a Barcelona battle that he both witnessed and participated in, and it's as gripping and politically "interesting" as anything in the book. The effect I got was the one described in my first paragraph – the sense that ideology was as fervent, florid, fractured and unpredictable as it had been in any time the previous 200 years. These years immediately preceding World War II were terrifying and defining times for the horrors that were to follow, and the book feels, with the benefit of hindsight, like a passion play and warning for the larger, more global battle to come. Orwell's genius is in both transmitting this sense of foreboding while also writing a "light" sort of diary of his and his comrades' bumbling misadventures. It's a terrific addition to the high school Orwell canon of "1984" and "Animal Farm", if a bit too dense and historical for modern students of our profoundly illiterate age. "A SHORT FILM ABOUT LOVE"